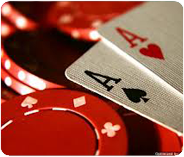 The dealer (known as the dealer in poker) shuffles the deck. The two players to the left of the dealer (or the player with the tab if a professional dealer at the table) pay the blinds, a small (the closest) and great. 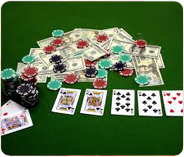 Starting with the player to the left of the dealer (or token representative) and direction clockwise, each player receives two cards face down. The first betting round starts and does the player to the left of the big blind (bet every player in clockwise clock). The first player and then the rest have the option of seeing the big blind (call), raise the bet (raise) or to fold (fold). Once the first betting round is complete, the dealer places a card face down that comes into play (burning the letter) and then placed in the center three backs, what is known as flop. 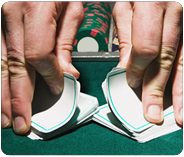 When this second round of betting is complete, the dealer will burn a card again (it upside down and it does not come into play) and shows another in the center, known as the turn. The third betting round follows the same indications as the second. 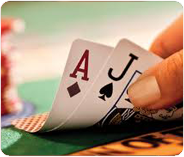 When this round of betting is complete, the dealer will burn a card again and put on the table the last community card face up, called the river.